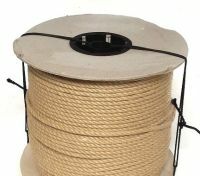 A Kingfisher product ~ your guarantee for a superior mooring line, boat rope or yachting rope. Polyester has a specific gravity of 1.38 g/m3 and will sink in water. It is strong, comfortable to grip and takes knots well. It does not weaken when wet, is very durable and the matt finish does not reflect light making it ideal for Film, Stage and Theatre. Manufactured for Ropes Direct in Europe. 12mm Matt Polyester Rope sold on a 100 metre reel.